]left]The opening moves show clearly black's advantage. An open row of three (one that is not blocked by an opponent's stone at either end) has to be blocked immediately, or countered with a threat elsewhere on the board. If not blocked or countered, the open row of three will be extended to an open row of four, which threatens to win in two ways. White has to block open rows of three at moves 10, 14, 16 and 20, but black only has to do so at move 9. There are two forcing sequences for black, depending on whether white 22 is played next to black 15 or black 21. The diagram on the right shows the first sequence. All the moves for white are forced. 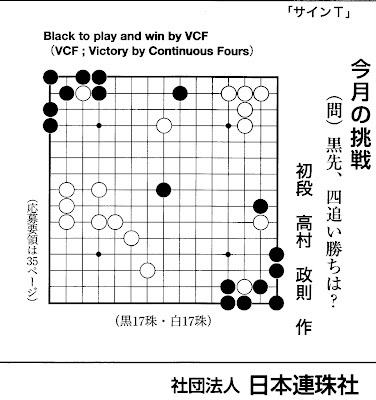 Such long forcing sequences are typical in gomoku, and expert players can read out forcing sequences of 20 to 40 moves rapidly and accurately. The diagram on the right shows the second forcing sequence. This diagram shows why white 20 was a blunder; if it had been next to black 19 (at the position of move 32 in this diagram) then black 31 would not be a threat and so the forcing sequence would fail.